I told myself that I wasn’t going to buy anything special for Valentine’s Day crafting. “If I don’t already have it, I’m not going to buy it!” I told myself knowing full well that if something cute enough came up that I was lying to myself. 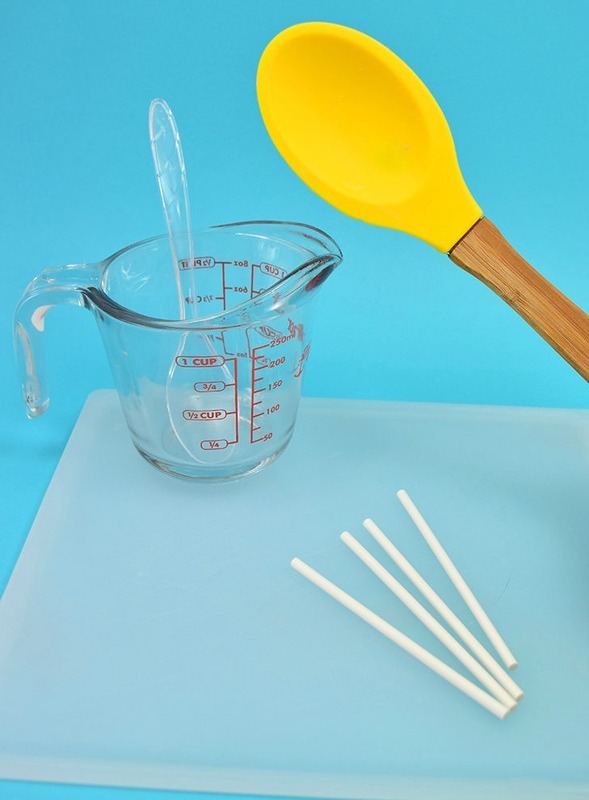 And so it came as I was trying to find a certain kind of yarn online I saw this adorable and frilly looking silicone lollipop pan and I knew that I had to have it. 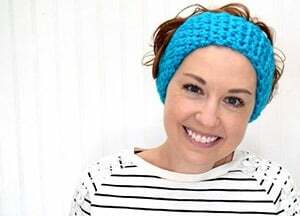 In fact, I hopped in the car and headed to the store right then thinking that if I didn’t it just might sell out! Little did I know that there was a stack about as tall as me on the shelves there at Michael’s. 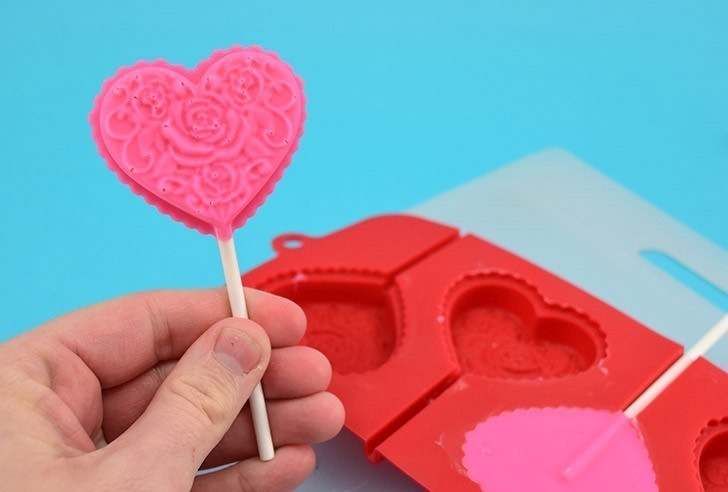 Undeterred and breaking a promise to myself I brought home this cute heart shaped chocolate lollipop mold and got after it. Now if you read the post right before this one you might be wondering what the heck is up? 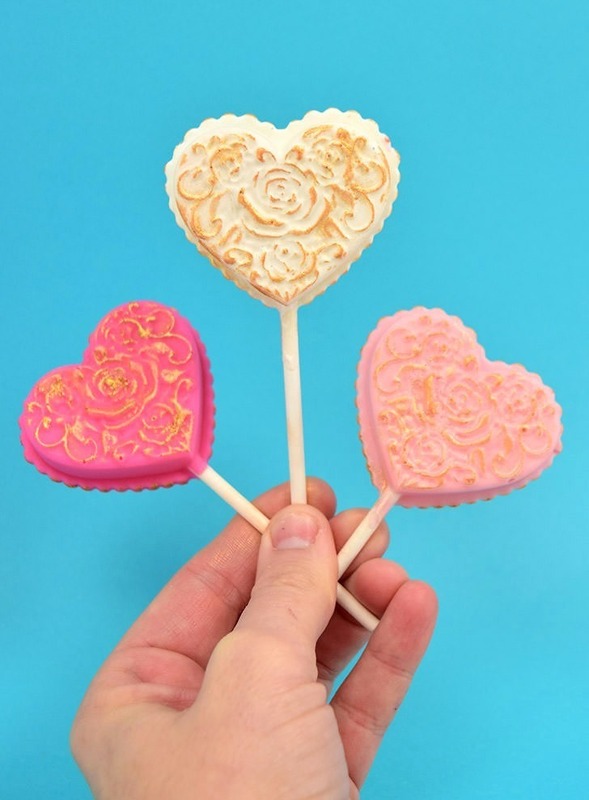 I mean, I just complained about candy and sweets and chocolate and made FAKE CHOCOLATES that are actually the cutest little truffle soaps to stay away from sugar. And then this? Well, I’m crazy fickle. End of. 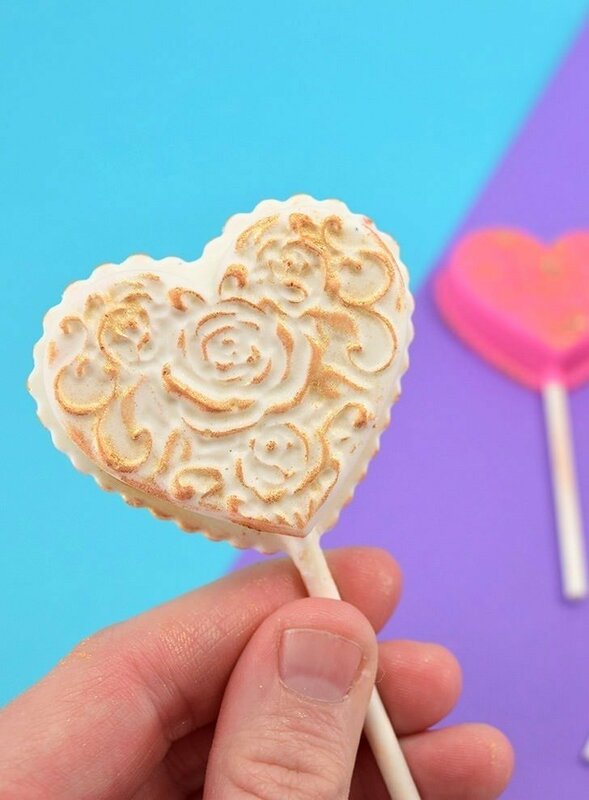 Want to see how easy these are to make? You can seriously knock out a batch in just a few minutes. And since they’re so frilly and pretty (and even gold, gah!) you’ll have all of your Valentines thinking you slaved over a hot stove for them! 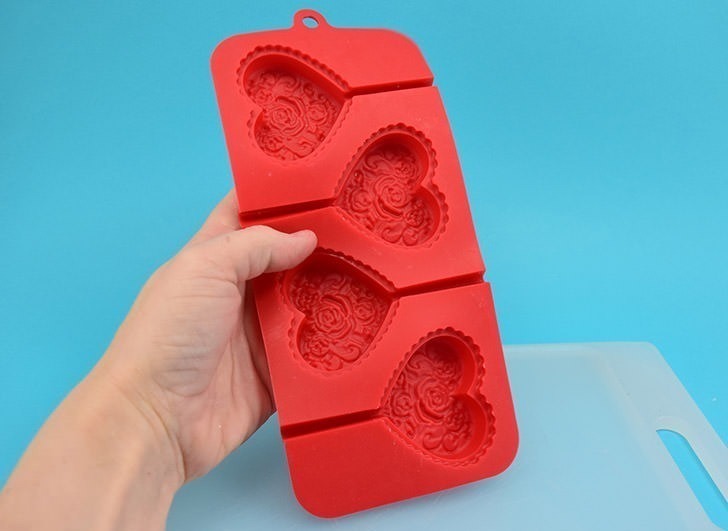 First things first you’re going to need a chocolate pop mold. Isn’t it so cute? When you get it wash it and let it dry completely. Any droplets of water will cause the candy to seize (which just means screw up your chocolate) and it won’t work out well. 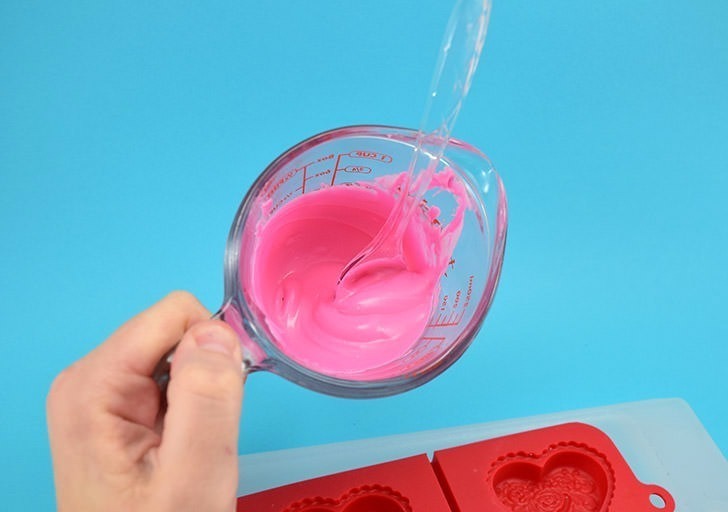 Some tools that are optional but helpful include a flat surface, like a cutting board or cookie sheet, and a silicone spoon or scraper. Just because I love you I counted out how many little Wilton Candy Melt discs you need for each pop and that number is 14. 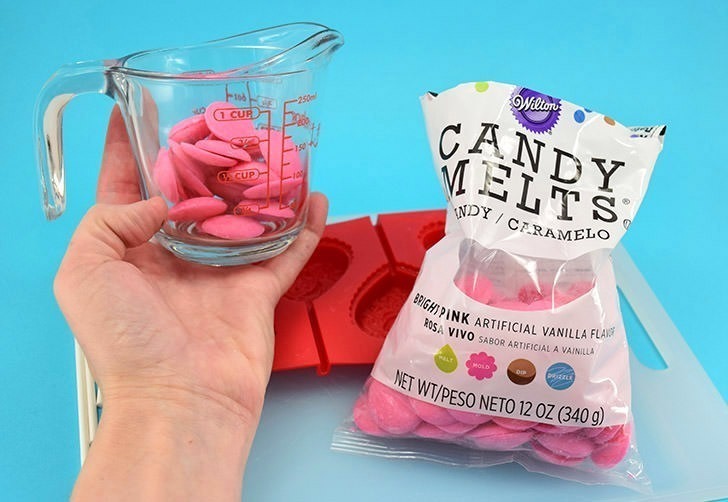 For each pop put 14 discs into a glass measuring cup and heat in the microwave at 15-30 second increments, stirring in between each microwave blitz, until the candy is mostly liquid. If there are a few chunks, don’t sweat it, simply stir the dickens out of the candy and the heat from the already melted goodness will take care of the rest for you. 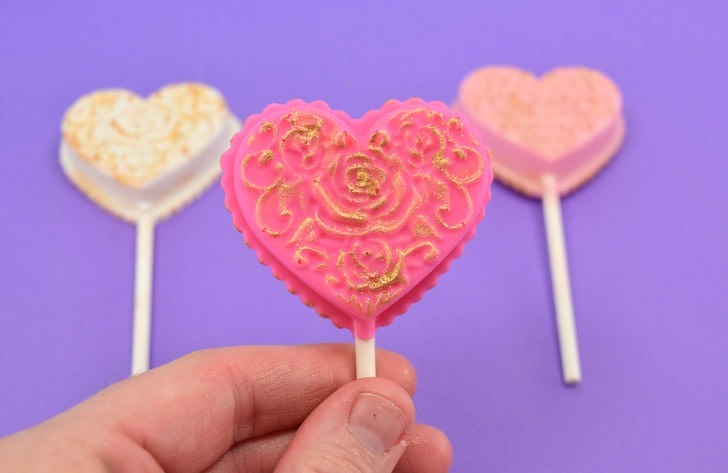 And if you’re wondering why you don’t just keep heating it you can check out my Tips for Working with Candy Melts post over here. 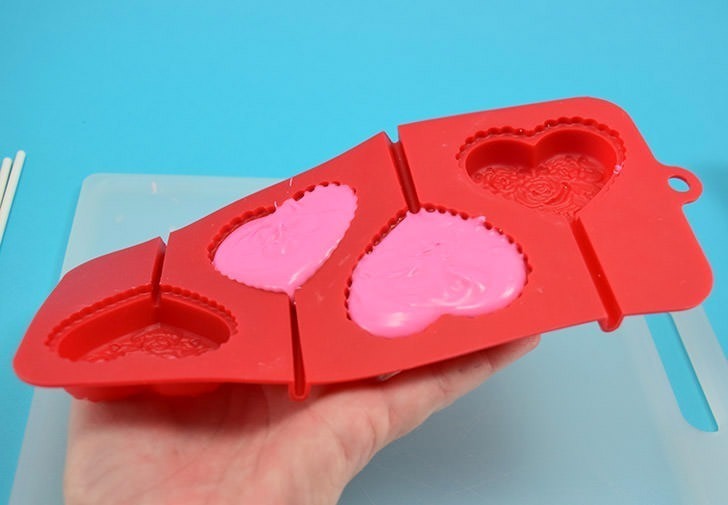 Place your mold on a flat surface and spoon the melted candy right into the center of each pop mold. Don’t try to spread that business out because you’re just going to make a mess. 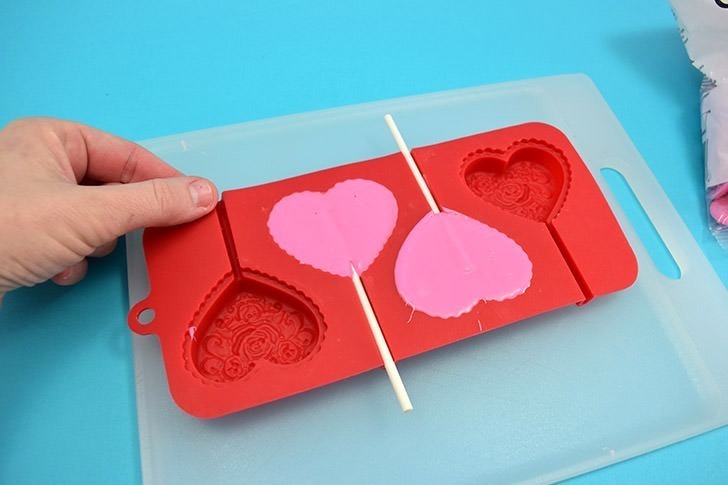 Instead, grab the corners of your mold and begin gently tap, tap, tapping it up and down to spread the candy to fill mold’s shape. Pick up the mold and twist it around to get into any strange crevices around the edge, like the frilly edge here on the pops. 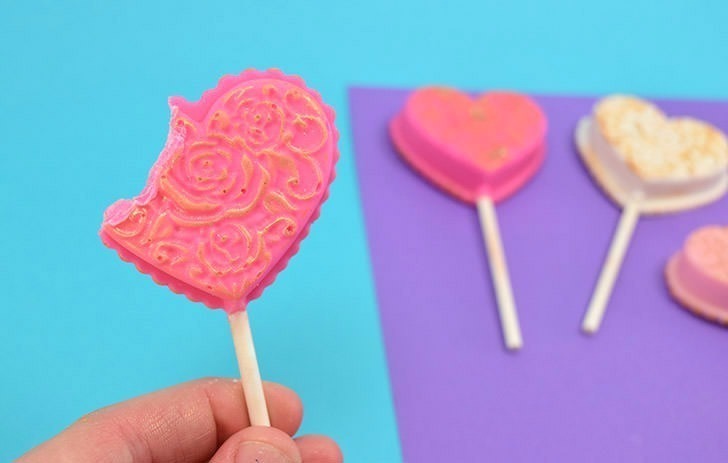 Lay your mold flat, again, and push your lollipop sticks into the mold. Push the candy end into the candy, just a little bit and then straighten the stick back out. 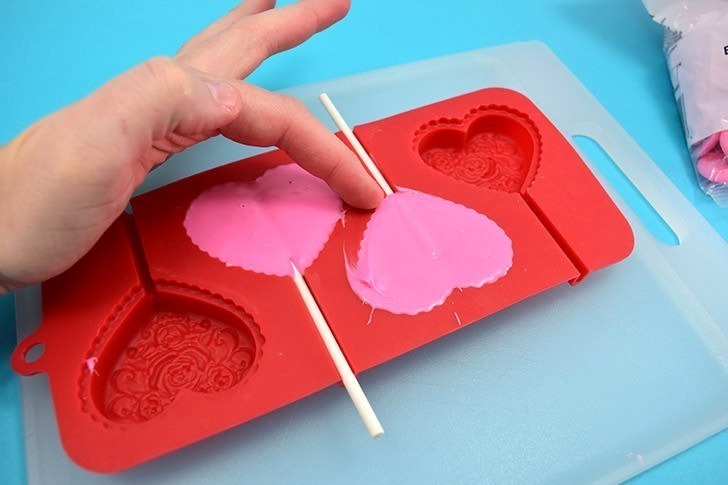 Tap, tap, tap that silicone mold until the candy spreads to cover the sticks. 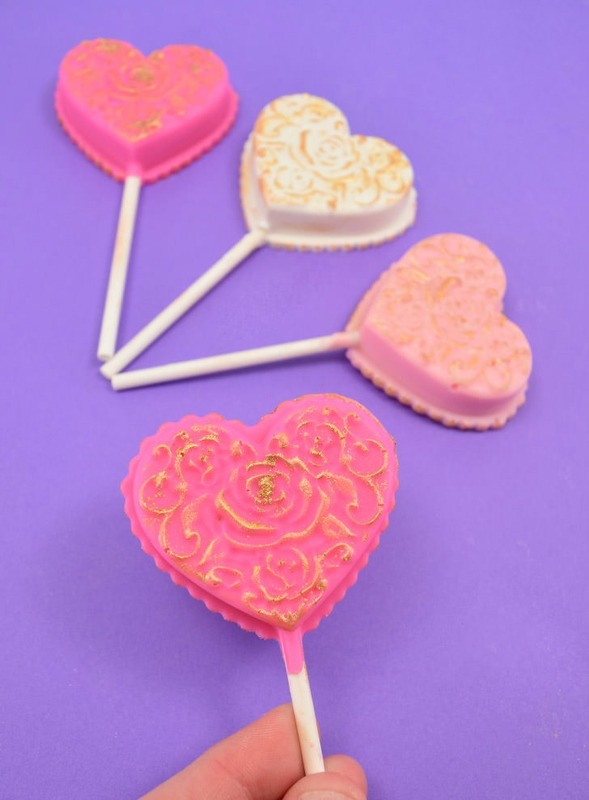 Now you have delicious candies that are pretty on both sides. Cool, right? I remember as a kid eating these kinds of pops and the backsides were always a swipe-y nightmare. Not these pops. Not you. You’ve got this business DOWN. 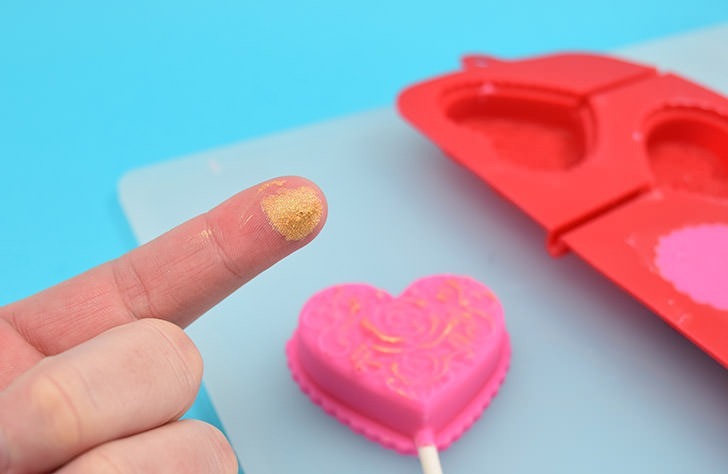 If in your tapping the candy goes outside of the lines use your finger or a paper towel to clean away the excess, taking care not to touch the candy in the mold you want to stay nice and flat. Pop this puppy in the freezer for 5 minutes and give it a quick check. Is the underside of the mold cold or is the chocolate still a bit warm? 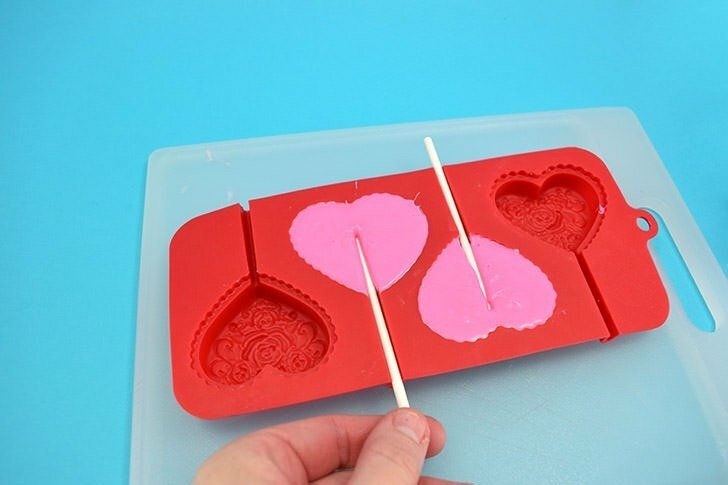 If it doesn’t feel chilled quite yet, flip the mold over and give the pops another 5 minutes to set up completely. 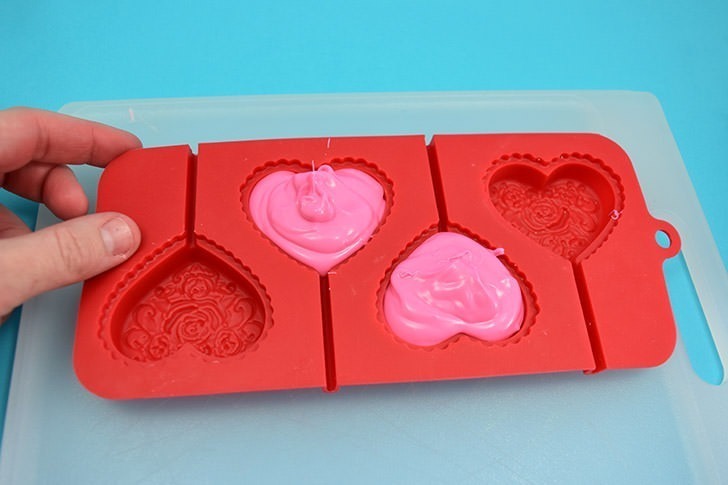 To pop the suckers out of the mold simply stretch the silicone away from the shape. Voila! 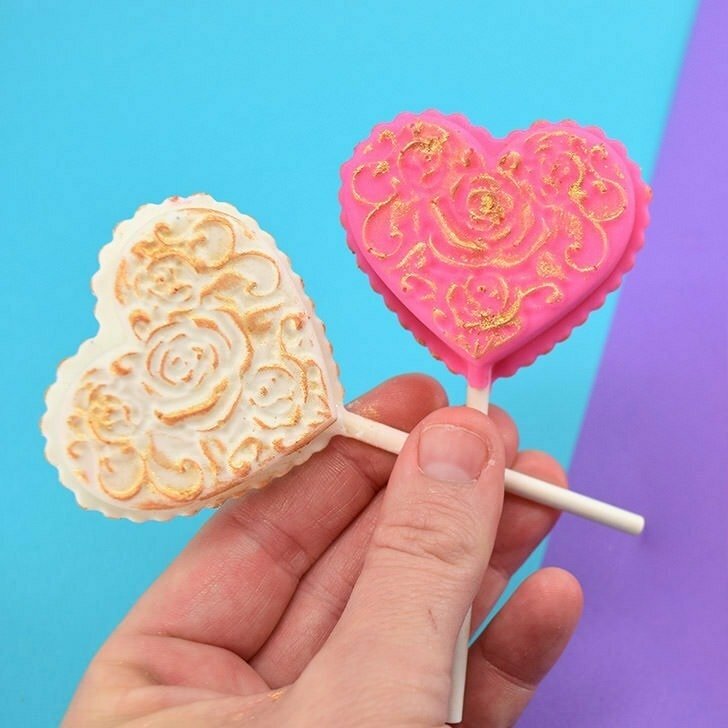 A little bit of gold lustre dust will take these pops from cute to fancy in no time flat and it takes just a tiny trace! Dipping your finger very slightly into the powder, trace the top, raised edge of the pop to outline the lacy pattern. 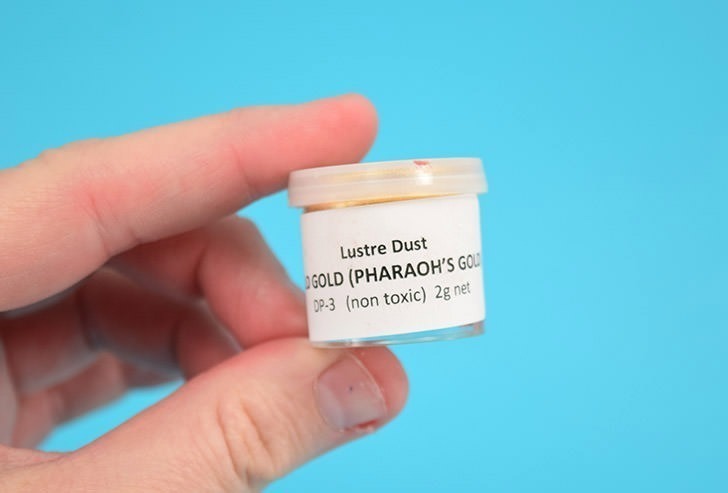 If done right out of the freezer the pops will have a bit of moisture on them that will make your gold a bit thicker and it might clump in places. In all honesty, I don’t mind how mine turned out when both waiting for the moisture to dry off (the white pop) or going straight at it out of the mold (the pink). Now isn’t that just so lovely? I made a few bright pink pops and I also tried light pink and red. The light pink is okay but the gold is difficult to distinguish. The red I just hated because it’s like the gold made the red look more brown. In fact I didn’t even photograph the red. YUCK! No matter the color, I can pretty much guarantee that they all taste delicious, but my favorite is this baby below, oddly enough. Even with my love of all things colorful, this pretty white and gold pop is such a beauty, don’t you think?